The IPG WLN Singapore chapter will host its second of four events for 2017 on Wednesday, July 19th at 6:30 PM. 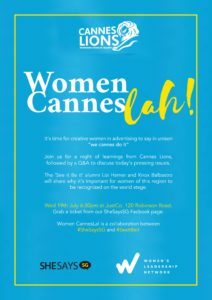 Titled ‘Women Cannes’ Lah!,’ a play on words building on a popular Singaporean expression “Can-lah” which means “yes, absolutely,” the event will feature a night of learnings from Cannes Lions followed by a Q&A to discuss today’s pressing issues. The event is in partnership with SheSays Singapore, an organization focused on the engagement, education, and advancement of women in creative industries. A ‘See It Be It‘ 2017 participant and WLN committee member Lizi Hamer, Regional Creative Director, Octagon, will lead an evening discussion along with another ‘See It Be It’ alumna, Knox Balbastro. They will share key learnings from their experience and dive into why it’s important for women of this region to be recognized on the world stage. For more event information and registration, please visit She Says Singapore Facebook page.